Pair of Chinese Export Porcelain underglaze blue round dinner plates with lush peonies in a fenced garden. Crosshatch and floral vignette borders. Line in one otherwise great condition. Pair of whimsical Chinese Export Porcelain underglaze blue octagonal dinner plates with a butterfly, banana plants, and floral vase on a leaf. 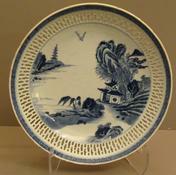 Single Chinese Export Porcelain underglaze blue dinner plate with bamboo, peony and floral garden on a fenced river bank crosshatch geometric border. Pair of Chinese Export Porcelain underglaze blue circular dinner plates with unusual floral reserves. Pair of Chinese Export porcelain underglaze Blue silver shape oval meat dishes with lush European floral spray in a shaped blue cartouche - Greek borders and pagoda river scenes including many Chinese figures conversing, riding, boating. Rim chips restored-otherwise Excellent condition. Chinese Export porcelain underglaze blue oval river scene reticulated fruit basket on original tray with beautiful molded shell handles. One glazed flake/chip at 5�oclock basket base -otherwise Excellent condition. Finial and chip on tray restored -otherwise Excellent condition. Chinese Export porcelain cutcorner Nanking salad bowl with excellent coloration, continuous outer river scene � dart, crosshatch and ribbon borders � excellent coloration. Note: 2 panel panorama. Chinese export porcelain underglaze and overglaze Famille Rose silver shape cut-corner rectangular meat dishes with colorful decoration showing �Romance of the Western Chamber� Note Artemisia leaf and pomegranate shaped border reserves. Excellent enamels, minor enamel flakes and retouch otherwise perfect condition. Pair of Chinese Export porcelain underglaze blue silver shape notched cutcorner rectangular meat dishes with molded back rims having finely detailed borders and pagoda river scenes including many Chinese figures conversing, riding, boating. Rim chips restored. Otherwise excellent condition. 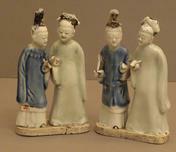 Pair of underglaze Blue and Celadon double Chinese figures on plinths. Base piece restored. Chips to extremities and one hand. Chinese Export Porcelain underglaze blue Tankard with finely painted peonies in a garden with rouge de fer and gilt highlights floral & geometric upper border. Pair of Chinese Export porcelain underglaze blue notched octagonal dinner plates with unusual basket weave molded borders. Over glaze Aubergire ribbons holding oval with rouge de fer initials � �H� � very finely drawn cavetto border of prunus and crosshatching. Unusual Pair of large size Chinese export porcelain underglaze blue oval butter tubs on original stands with river scenes � slight difference to one tray, excellent coloration. Line in base of one R.
Pair of Chinese export porcelain underglaze blue covered vases with cockerels in a floral garden perched on outcropping, excellent coloration. 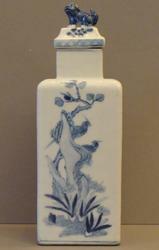 Pair of Chinese export porcelain underglaze blue square covered jar with each panel having a different bird or butterfly with floral decoration, glaze star in base. Rare form. Very well molded Foo Dog finial. Pair of Chinese export porcelain overglaze blue banded covered pots de cr�me with diamond border, gilt berry finial, rouge de fer � edge lines and lush European floral sprays. Ex-collection Swedish Nobleman. Chinese export porcelain underglaze blue finely reticulated circular deep dish with detailed river scene and honey comb inner border fritted rim. 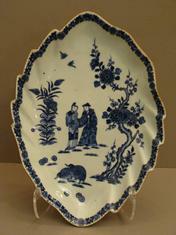 Chinese export porcelain underglaze blue shaped edge leaf dish with unusual scene of figures and quails in garden. See: China for the west II p 534. 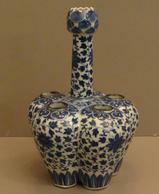 Chinese export porcelain underglaze blue scrolling lotus pattern cinquefoil crocus vase with molded lotus top. One rim opening chip otherwise perfect condition. 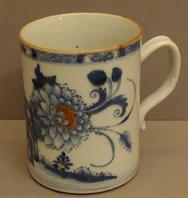 Pair of Chinese export porcelain underglaze blue handled baskets taken from a Japanese tea service. Line R to one handle joint two rim nicks R.